Prior to his appointment in St. Louis, Mr. Sparks was Associate Principal Flute with the Baltimore Symphony under David Zinman, and Principal Flute of the San Antonio Symphony and the Memphis Symphony. He began his career as Principal in the Canton Ohio Symphony and in Venezuela with the Caracas Philharmonic. In the summer of 2013, Mr. Sparks returned to the Aspen Music Festival and School where he is an artist-faculty member and Principal Flute of the Aspen Chamber Symphony. He also taught his fourth annual master class at Missouri's Innsbrook Institute, and joined the faculty of the Pacific Music Festival in Sapporo, Japan. Mr. Sparks is an enthusiastic teacher and maintains a private studio in St. Louis. He is a former full-time faculty member of the Peabody Institute, and frequently presents clinics and recitals in the U.S. and abroad. 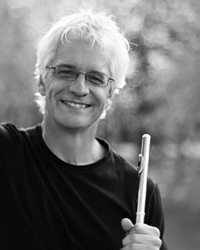 Mr. Sparks has recorded two solo albums, appearing on the Summit and AAM labels, and a new recording of French repertoire for flute and piano is planned for release in 2013. Sparks is also an avid writer about flute playing, and is a regular contributor to Flute Talk magazine's feature "From the Principal's Chair." Born in 1960 and raised in Cleveland and St. Louis, Mr. Sparks graduated Pi Kappa Lambda from the Oberlin Conservatory as a student of Robert Willoughby, winning the 1982 Oberlin Concerto Prize.